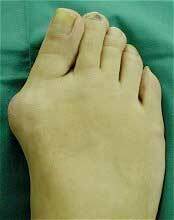 A bunion is a lump at the base of the big toe, caused by sideways drifting and angulation of the bones in the foot. Sometimes it is painful in itself, but more commonly it causes the symptoms by pressure on shoe-wear or, on occasions, by crowding or crossing the smaller (lesser) toes. The second toe can become so crowded that it becomes ‘clawed’, and crosses over the big toe. Is surgery the only way to treat Bunions? Early and mild bunions may respond to the application of splints or braces, although the effects are often short-lived. Wearing ‘corn plasters’ or ‘pads’ may relieve local pressure symptoms. Shoes may be made or adapted to accommodate the bunion within a broad front (toe-box). Some bunions are caused by flat foot and collapse of the arches. These can be helped by arch supports. More severe bunions can only be corrected by surgery. Surgery should only be undertaken if the symptoms are significant and appropriate non-operative management has been considered. The surgery is usually carried out under a general anaesthetic, with local anaesthetic being used to reduce the amount of general anaesthetic required. Surgery is usually performed either as a daycase (where you do not have to stay in hospital over night at all), or with an overnight stay in hospital. An ‘osteotomy’ is an operation when the bone at the base of the toe (the metatarsal bone) is divided and ‘displaced’ into the correct position. The bony bump is usually trimmed at the same time. The operation aims to straighten the great toe, and narrow the forefoot. Because the operation involves dividing the bone, it has to be held in position while the bone heals together again. In the majority of cases small screws, wires or staples are used. The foot is usually protected in a special post-operative shoe during this time. Occasionally the big toe is osteotomised as well, a procedure known as an ‘Akin’. The fracture in the bone allows the bones to be repositioned, so that the bunion disappears. After the operation, you will wake up with your foot in a bandage. The foot is always painful, but painkilling tablets usually control this. In order to minimise swelling, you will need to keep your foot up after the operation. You will be given a special shoe to wear after surgery. This should be worn at all times, including in bed at night. To start with you will need to rest your foot up (above heart level) most of the time. When the foot is lowered it will throb and swell. This should be avoided. With time, the period you can keep the foot down will increase. After two to three weeks after the operation you should be able to keep it down most of the time. At around two weeks after surgery, you will return to the clinic for removal of stitches. It is important to exercise, or mobilise the toe. This can be started after surgery, and you will be advised of the exercises. Failure to undertake these exercises increases the risk of developing stiffness of the toe after surgery. On average, you should expect to spend six weeks in the post-operative shoe. After this you will need an open toed sandal, preferably with adjustable straps. It will be a further six to eight weeks before you can wear a shoe for a working day, and it is usually three to six months from the operation before you can hope to resume recreational walking or light sporting activities. It may still be necessary to wear flat soled shoes after recovery from the surgery. If you are slower than these time do not panic, they are only averages, but let your surgeon know when you attend the follow up. Over-correction of the bunion, so that the big toe points inwards. Sensitisation and pain in the foot due to damage to the nerves or blood vessels in the foot. Stiffness of the big toe. The screws become prominent and require removal at a later date. Weight transfer to the second toe (a corn under the second toe). Infection of the skin, and rarely of the bone. The complications of any surgery such as thrombosis (a blood clot) and anaesthetic problems. Most problems can be treated with medications, therapy and on occasions by further surgery, but even allowing for these, sometimes a poor result ensues. For this reason we do not advise surgery for cosmetic reasons. The level of symptoms before surgery must be worth the risk of these complications. We also advise against prophylactic surgery (surgery to avoid problems that are not yet present). If you are at particular risk of complication, this will be discussed with you. If you have any general or specific worries you should ask the doctor treating you who will explain it to you. Some problems such as recurrence of the bunion, or corn formation become obvious with time.